The Core Secrets� program helps you burn more calories, tone more muscle groups, and melt away more inches�more efficiently than traditional exercise programs. How? When you alternate exercises between the upper and lower body, your heart and lungs have to work harder to send blood through to these major muscle groups at opposite ends of the body � burning more calories than you would with weight lifting or aerobics alone. 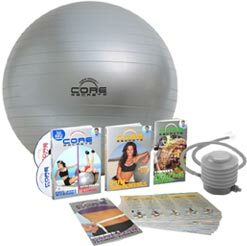 Plus, since your entire workout is done on the Fitness Ball, your core muscles are engaged during every exercise just to maintain your balance. What's more, thanks to constant mobility, your muscles have to fire differently each time you do it�so your workout always stays challenging, fresh and fun. With your help we can reach more people and let them know about Core Secrets whether this product works or not. The infomercial was great, but the actualy session is not. In an effort to give every thng that I buy a fare change to work, but trying it again and again, I let the date for return pass me by. I would have sent it back. The kids burst my ball, so I had to buy another one. This shocked me, but such is life. Once can get a nice squat and reach session going on if you are willing. In the end, it was a bit expensive and not that great intense workout that I need to change my body. I would recommend buying the ball some where else because it does work well with sit-ups. The video is pointless and the infomercial is more to get you to order so they can sign you up and bill your credit card for monthly videos that cost $50. READ THE FINE PRINT!!! A reasonably beginners product, for advance training I did not see much effect. The exercise videos is great, help to change my routines up. My girl friend enjoys it. Core Secrets works great. In 2-3 weeks I was getting results. Something different from the usual situps and weight training.